Note from the editors: This piece originally appeared at Arts Everywhere. It is reprinted here with kind permission from the author. 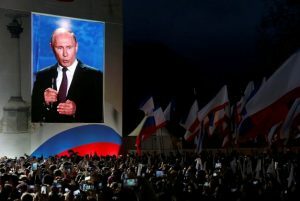 On March 3rd, 2018, the main pre-election rally for Vladimir Putin took place at the Luzhniki Stadium in Moscow. Tens of thousands of public sector workers were brought in from various regions of the country and were expected to listen to the President’s speech as well as those of actors and singers who came out in his support. Not long before Putin himself appeared, Grigory Leps, a popular singer with a criminal past, performed his song “The Very Best Day.” Precisely six years previously on the eve of the 2012 Presidential Elections, Leps had also sung “The Very Best Day” at another meeting in support of Putin. The script had hardly changed, as though confirming the victory of the immutable political regime over the passage of time. Indeed, presenting Putinism as an “eternal present”, founded upon a heroic millennial national history, remains one of the key ideological tropes of the ruling elites. However, in reality “the very best day” of 2012 is completely dissimilar to “the very best day” of 2018. Back then, the regime received the support of the majority through more than just patriotic rhetoric. With the backdrop of high oil prices and continuing economic growth, Putin was able to promise an increase in public sector salaries and guarantee a growth in incomes for the population as a whole. But in 2018, Russia is a country ever more deeply plunged into poverty and deprived of viable prospects for any new economic recovery. The annexation of Crimea in 2014, ensuing sanctions, and the fall in energy prices curbed the development of a Russian model of capitalism based upon the predatory exploitation of industrial potential inherited from the Soviet era. Over the past few years, the government of Dmitry Medvedev has consistently enacted a Russian version of “austerity measures” whose severity would be envied by the elites of the European Union. Health and education were subject to “optimization programs” accompanied by the closure of schools and hospitals, while inflation was restrained mainly through the effective “freezing” of wages. Russians have been and continue to pay for a crisis created by the elites. The “besieged fortress” rhetoric adopted by the government since the start of the Ukraine crisis has allowed practically any social protest to be declared as part of a hidden “hybrid war” deployed by the West against Russia. On the eve of his new six-year term, Vladimir Putin is unable to propose anything other than continued economic stagnation and a deeper plunge into poverty. The real government program, which experts openly discuss, anticipates an unflinching adherence to “budgetary rules”, an increase in pensionable age, and a further reduction in social spending. This frightening lack of any future prospects was fully reflected in the programmatic speech made by Putin on March 1st, 2018. Pronouncing several perfunctory promises “to improve the quality of life”, he then moved to the main subject matter — military threat. 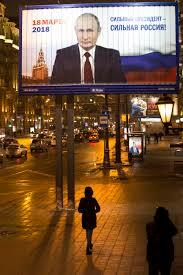 Over the small presidential figure, huge screens were lit up, flashing graphics reminiscent of an earlier generation. Putin described with gusto new types of nuclear armaments which would be able to break through the American missile system with ease. Putin made his oft-repeated argument of recent years: if the West is not ready for talks, we will make them listen through our strength. The growth of Russia’s military power has been the result of Putin’s rule. However, the country continues to find itself surrounded by enemies, so continuing the current course is necessary for its survival. Consequently, military rhetoric becomes the main ideological orientation of domestic policy, justifying both the neoliberal social course, as well as the ensuing crackdown on civil rights and the further entrenchment of the authoritarian regime. The manifold security structures, whose funding has continuously increased in recent years, have been given a mandate to act under a state of permanent emergency in the struggle for the unity of the nation in the face of an external threat. It is no accident that, on the eve of the elections, the Russian Federal Security Service (FSB) initiated a new large-scale case against Russian anarchists. In their effort to build up an absurd picture of an armed conspiracy against the regime, the FSB investigators have resorted to physical torture to obtain the evidence needed. The resort to external and internal threats as the main justification for the government’s legitimacy in fact demonstrates the weakness and degradation of the existing regime. Behind the predictability of Putin’s victory in the decorative elections of March 18th lurks the unpredictability of further developments in the country. Ilya Budraitskis is a historian, cultural and political activist. Since 2009 he has been a Ph.D. student at the Institute for World History, Russian Academy of Science, Moscow. In 2001-2004 he organized Russian activists in mobilizations against the G8, in European and World Social Forums. 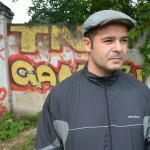 Since 2011 he has been an activist and spokesperson for Russian Socialist Movement. Editor of OpenLeft.ru and member of the editorial board of “Moscow Art Magazine”. Regular contributor to the number of political and cultural websites.